We offer professional, high quality grooming services for any breed or mix by appointment. 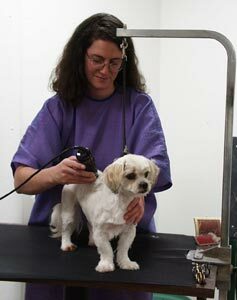 Fees vary by the level of grooming required and the condition your dog is in. We would be happy to give an estimate based on size and breed/mix--just ask! When your pet arrives for grooming, it will be inspected for fleas and other parasites before being gently and thoroughly bathed. After bathing, your pet will be hand dried with a warm, forced-air dryer. During the bathing and drying process, we will be on the lookout for any skin problems or other health concerns bothering your pet so that we can take the extra care necessary, and pass these concerns on to you for follow-up. Once your pet is thoroughly dried and brushed out, we'll begin the grooming process, which includes toenail trimming, ear cleaning, and ear canal plucking if necessary. Laurie is a graduate of the Wisconsin School of Professional Pet Grooming as well as a longtime AKC conformation exhibitor, so her expertise will ensure that whatever the breed, your dog will look his or her best when you arrive. Drop us a note or call 715-824-3900 for information or to setup an appointment. Our office hours are Monday - Friday 8 am to 6 pm; Weekend grooming during the hours of Saturday 8 am - Noon and Sunday 2 pm - 6 pm is sometimes available by special arrangement. Camp Bandy boarding services are available for dogs of all shapes and sizes. Our daily rate for boarding is $22 single/$40 double occupancy. Campers stretch their legs and play in our spacious exercise yards a minimum of four times daily. Of course, ear scratches and belly rubs are no charge. Spacious, climate-controlled indoor/outdoor kennels ensure that your camper has a comfortable stay. We provide Kuranda Cots for all boarders, and will happily add your own pet bed if your pet prefers it. Our food of choice for boarders is Eukanuba Adult, however we would be happy to feed any food provided by you...and we'll happily administer your pet's medications at no extra charge. Sunday 2 pm - 6 pm. Drop us a note or call 715-824-3900 for information or to make a reservation.